STOP! Building a new barn? Save thousands of dollars, no need to pour concrete! Concrete & Horses are like children on thin ice…an accident waiting to happen. 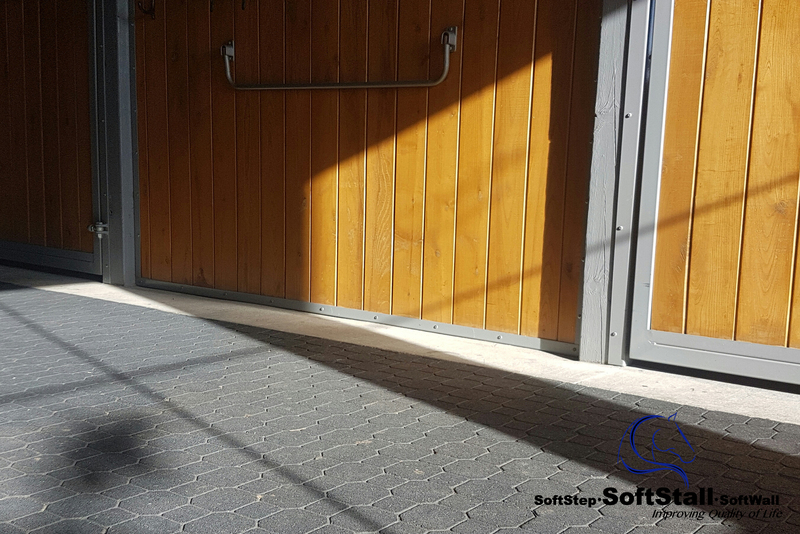 Our entire environmentally friendly SoftStep™ line is manufactured from recycled rubber and is ideal for all barn entrances, aisle-ways, wash & tack stalls, path-ways, horse exercisers and more. Our SoftStep™ rubber tiles are unique in that they come in a large format characteristic making installation fast and easy! SoftStep™ is a cost effective alternative to concrete or asphalt. They are perfect for both new barn and retrofit construction. Offering a non-slip surface even when wet, they will provide and your horse with a comfortable, sure footed surface. 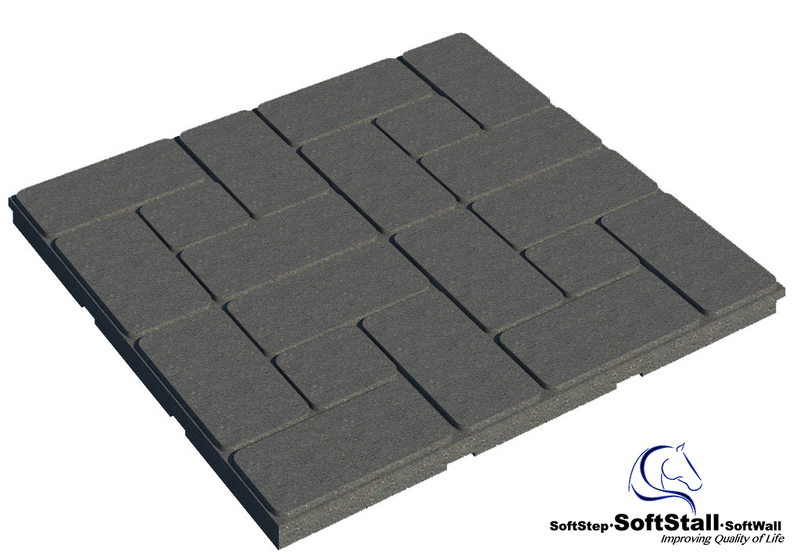 With a substantial insulation factor, the SoftStep™ tiles help prevent the transfer of cold and dampness. All of our SoftStep™ tiles provide a safe, non-slip surface even when wet. 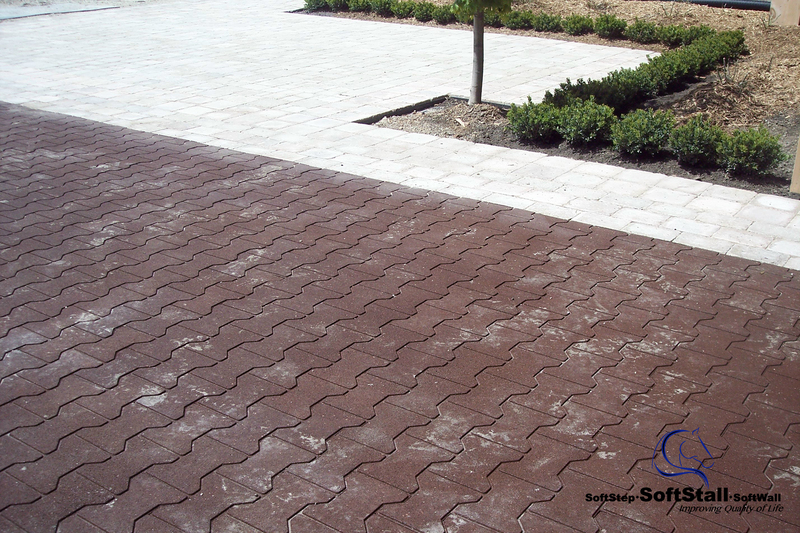 All tiles are durable under, equestrian, farm equipment, and pedestrian traffic. All tiles are resilient to cleaning and disinfecting products and are manufactured with U.V. stabilization. Installation is not difficult as the tiles are easy to handle, assemble quickly with the larger surface area and can be cut with most simple tools such as a jig saw or skill saw. One of our most popular rubber tiles our Lockstone rubber tile is characterized by its unique ability to lock into its own pattern on all four sides. This product is very easy and fast to install. Its low profile pattern means it is very easy to sweep and clean. A very elegant pattern with non-slip, insulative and durable benefits. • Size: 37″ W x 37″ L or 9.5 sq. ft. per tile. • Applications: Compacted surface, ideal for both in-ground and re-surfacing. • Skid = 2000 lbs. The Brickstone tile is an eye catching option with a basket weave design in a square tile format. The feature of this rubber tile is the lap seam to allow for a tight fit. This makes the tile quick to install and can be adhered to a concrete surface or over a compacted gravel surface the lap seams can either be screwed or glued together. This tile is durable for all farm equipment. It provides the safe non-slip surface you would expect and the large low profile patterned surface makes it easy to sweep and keep clean. • Shipping: 30 per 4′ x 4′ x 3.5′ Skid = 2000 lbs.